I love seeing these guys in movies together. So obviously, I love seeing them both get recognized for their own, respective movies, together. It’s not often I can sit my eyes (my special eyes!) through a double feature, but with the countdown clock ticking louder and louder in my ears, I couldn’t waste another hour of free time. So, I paid the $18.50 (I mean, still recovering from sticker shock) for my 2:20pm movie to watch Sandy flail about in space, perfecting her free-fall scream and her deep breathing techniques. That is what the movie is, if we’re going to get right down to it. And (thanks in large part to the real-life imitation by one DD Shlien), I was ready for it. What I wasn’t ready for was how much more the movie was. Written by the Cuaron brothers (a cool, artistic and Italian version of the Coen Brothers? ), it’s more than a space walk in that it’s a journey through self. Specifically, Sandy’s Dr. Ryan Stone self–a loner who lost her child and can’t cope with anything but radio and silence. 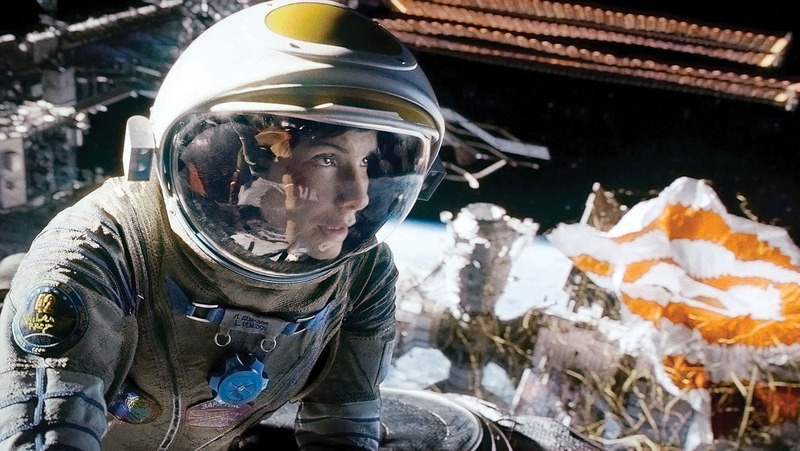 It makes sense that she’s pretty ok when it comes to abandoned crisis in outer space. I mean, not to take anything away from her panicked moans or her panting (neither sexual, in the least), but Dr. Stone is pretty solid. She loses what we believe is her only key to survival (and eye candy, since it’s George Clooney), yet manages to face the situations head on and casually eerie-meenie-miney her way around the earth. We learn small details of her life with each stressful moment, but those details don’t actually matter, because what we’re really watching is someone get to know themselves, for the first time, in a long time. We’re witnessing someone measure and judge their own self worth. We watch the light wax and wane in her own eyes, and it’s a force to be reckoned with – props, Sandy. The same goes for Matthew. The props, I mean. And they’re major. I’m about to make a big statement, so do whatever it is you feel like you need to do to prepare yourselves.. Matthew may just give Leo a run for his money come March 2nd. I know–I can’t believe I said it! But, I can’t hide from the truth. This guy, who has done way more than 10 things for us to hate about him (redeeming-ly, though, with tanned abs and sun-kissed locks) has erupted in the last year with projects reminiscent of his Grisham days. (Have you been watching True Detective???). 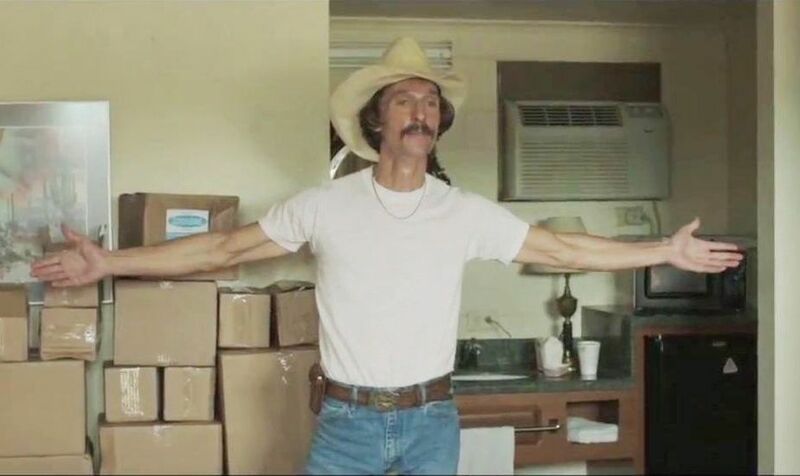 His tiny, scene-stealing role in Wolf of Wall Street to this utterly transformed version of himself in Dallas Buyer’s Club is enough to slap me in the face with respect for the guy. He’s a damn good actor. And that’s an emphasis on the “damn!” DBC is a seriously tumultuous story, one that sickens and heartens you at the same time. I am not sure how great the storyline is, but can say that it honestly didn’t matter to me in the long run. Matthew’s turn as Ron Woodruff–the horny bull-rider who gets diagnosed with HIV–carries it. He delves so far into the character that no matter how many times you try to remember that it is actually Matthew McConaughey, you can’t, because you’re too far lost into this guy’s tale. It helps that Jared Leto returns to us in full-on ridiculous form. And that’s ridiculous in a good way – I hope this is just the beginning of his return to the screen. And, he’s hot, even as a girl. Bottom line – these Hollywood staples give the Hollywood shoo-ins a worthy opponent on Oscar night. 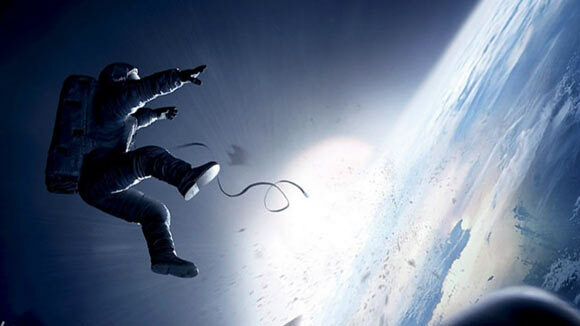 Both films are worth seeing before then (Gravity, in the the theatre, in 3D).